15 message, programmable LCD display, with 2 lines of 16 characters. 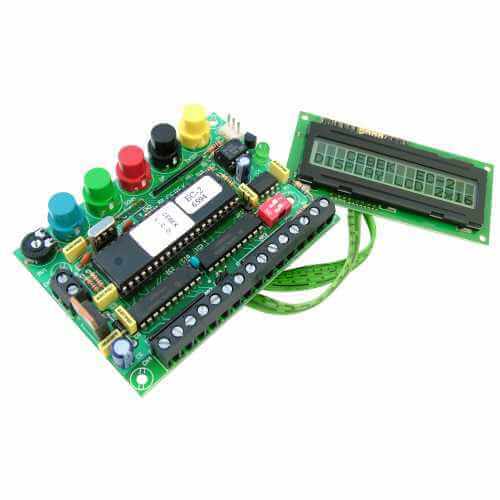 One default message and up to 14 other messages are programmable using an onboard keyboard or a second pre-programmed board. Any of the 14 remaining pre-programmed messages can be displayed by activating their respective inputs. A data transfer cable is also available, which allows for messages to be sent from one module to another, therefore avoiding manual programming. The module includes protection against inverse polarity, indicator LED and screw terminal connections. serial connector - this allows you to dump the pre-programmed messages onto a second module.